Obsessive-compulsive disorder (OCD) is an anxiety disorder in which people have unwanted and repeated thoughts, feelings, ideas, sensations (obsessions), or behaviour that make them feel driven to do something. A number of individuals with OCD exhibit symptoms pertaining to diet and eating habits. Fear or paranoia that one will suffer an allergic reaction without rational or medical evidence to support such an allergy is another common food-related symptom of OCD. Individuals with OCD may also fear they will experience allergic reactions to various chemicals used in food storage and preparation methods. Individuals with OCD often demonstrate a perceived need for specific rituals at the dinner table. Such behaviour may include an intense emotional desire to eat at specific times and display a persistent adherence to specific portion sizes. 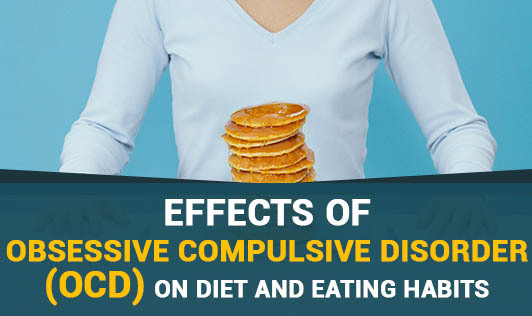 While there is significant overlap between eating disorders and OCD, eating disorders manifest themselves more by means of weight control, calorie counting, and obsession with thinness than other factors related to food. Many individuals with OCD find themselves terrified of dealing with germs, dirt, and other bacteria. In the case of food, this can lead to serious negative consequences. A person may fear consumption of a particular nutritious food, such as a vegetable, because it was grown in dirt. In reaction to this form of obsession, a person might scrub food repeatedly until they are convinced the food is not contaminated. In severe cases, the person may never feel the food attains an acceptable level of cleanliness. People who experience fear of unclean or tainted food may have difficulty eating in social settings, since they are not aware or in control of how the food was cleaned or handled. If you or a loved one demonstrates compulsions regarding food or eating, discuss your concerns with a trusted professional.